Ready-to-use, freshly prepared spicy Green Chilli. With the support of our team of experts, we are engaged in providing a wide range of Green Chili Paste. We Offer Green Chili Paste which are widely used in curries and dishes for adding taste to them. Green Chili paste is also available with us. Green Chilli Paste Known For Its Fiery Taste, Prepared With The Perfect Mixture Of Green Chilli, Lemon Juice And Salt. We are involved in offering fine quality Green Chilli Pastes, which is processed using fresh chillies. Furthermore, these effective Green Chilli Paste only less amount of paste is need to add to the dish in order to enhance its taste. In order to make it free from moisture and harmful chemicals, we are offering this paste in air tight containers. Green Chilli, Edible Common Salt, Water, Acidity Regulator (E330 & E220). Stabiliser (E 415), Contains Permitted Class II Preservatives (E 211). We are providing wide range of green chilli paste to our valued clients and although we are a new business entity commenced our business operations in the year 2012, our wide range of paste, chatni and juices are successfully become a preferred food ingredient of our valued clients. Leveraging on our expertise, we put forth Green Chilli Paste. This is made using fresh green chillies sourced from trusted vendors of the market. A small amount of this paste can be used for the purpose enhancing the taste of varied kinds of dishes. The packaging professionals ensure that these are packed in air-tight containers for the purpose of making these last long. It can be used in any Curry (Sabji), Pavbhaji, Kebabs, Rasam, Sambhar.etc. Austin Foods & Beverages Pvt. Ltd. Being a well established-organization, we are engaged in offering a distinguished range of Green Chilli Paste. Green chilli is a very well known spice for its fiery taste. It is often preferred by Jain people. It can be made into paste by washing them thoroughly, removing the stem and chopping into medium pieces. Further, grind them into mixture with sufficient lemon juice and salt. 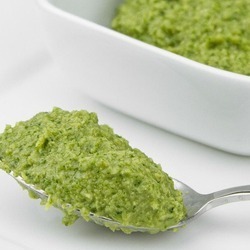 We are leading supplier of Green Chilli Paste. Having heard to the individual demands of our patrons, we ensure to deliver with a durable and eminent series of Green Chilli paste in within the stipulated timeframe. Red Chilli Paste Good Quality in all types of packing available.